Volume 4 sounds like bad news. My favorite couple on the verge of breaking up? NO. I would have wanted to skip this but obviously can’t. Looks like Kannagi Satoru is doing the books based on the seasons. Volume 2 is set in summer, while volume 3 is in fall. And now in winter. The cold weather is like a premonition of how cold the ambiance of the story will be. It is indeed a very cold winter for all of them. As the year starts, Kazuki and Wataru’s relationship is already on the edge. The one who suffers the most is Wataru for taking the blow in every direction, shaking the foundation of their relationship. It is as if the two are being pulled apart. The Ring Falls Silent gives us a full view of Shohei. If in the previous books, he makes it seem like a child play, this time he shows his cunning side. It is hard to hate this guy despite his eccentricities when there are times that he shows compassion to those of whom he approved. Opposite to the honor student Masanobu, the hot-headed Masa’aki is introduced in this volume. Because everyone here got to be superhuman and good-looking, Masa’aki is like the wild version of Masanobu who skip a grade in college in America. He has a big brother complex that adds to Wataru’s trouble. I still can’t believe that this guy is a year older than Wataru (so that makes him at Kazuki’s age?) yet on the same grade as his older brother. He is so childish, I thought he is in high school. Think of him, as the male version of Miho Ookusa. Just like every love story, the couple has some (unwanted) space. Sure, they are invincible together. But what if when they’re not? This is probably what Shohei wants to see in both of them and not really because of their homosexual relationship. Shohei must really have a twisted way of showing his affection. While the story appears to focus on Wataru’s hardship, there is another person experiencing a different level of hardship: Asaka Masanobu. It’s like the whole book is about his struggles with his feelings. This book is heartbreaking mainly due to Asaka alone. Why can’t this be a BL game so I could play his route and have a happy ending with him? Funny how I’ve mentioned in my volume 3 post that I love how their make-out scene is sugar-coated. Wait till you read volume 4 and it will be more detailed this time. Gone are the “riding in sweet waves” line lol. 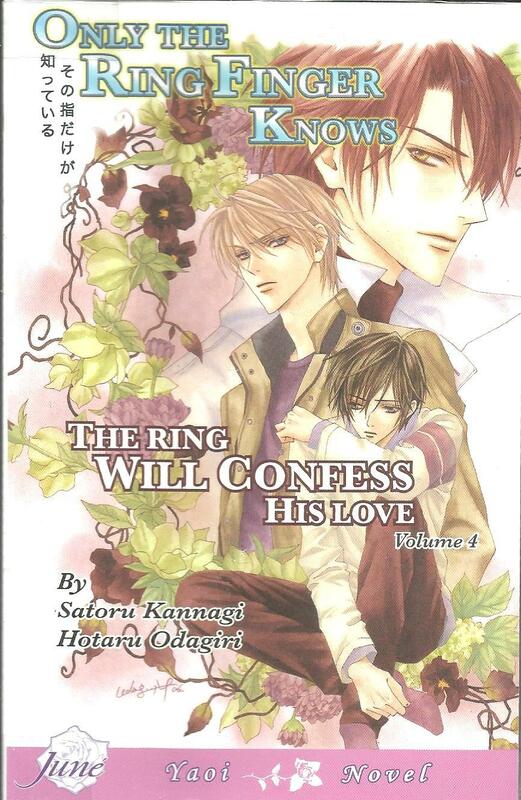 The Ring Will Confess His Love is bad for the heart especially if you are Pro-Asaka like me www. This is the saddest book so far yet I feel that this plays an important part for all of them. You can say that this the turning point for every character before they wrap up in the next volume.